The Model TGR is a rigid VELUX Sun Tunnel Skylight® that is perfect for installations which require longer tunnel length and an integrated look with the roofline. For installation on Southern exposures only. The Sun Tunnel Skylight emitts passive light from the sun without the heat emmitted by electrical light sources. The TGR rigid Sun Tunnel Skylight features a highly reflective tunnel that provides brighter, whiter light output in any application. The model TGR is great for long tunnel runs. The TGR features an innovative one-piece low profile metal flashing that is parallel and blends into roofline. For installation on South facing roofs only. The TGR comes with a pre-assembled ceiling ring and paintable ceiling trim ring to complete any look. The standard Model TGR Sun Tunnel is designed for low profile roofing materials such as shingles and shakes. The TGR Sun Tunnel Skylight installs on roofs with slopes between 15° (3:12) and 60° (20:12). 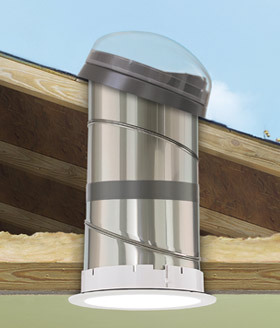 The Model TGF is a flexible VELUX Sun Tunnel Skylight® that is designed for shingle or shake roofs. It can be installed quickly around attic obstructions, making it the easiest tubular product to install in the industry. For installation on Southern exposures only. Available in 14" and 21" diameters. Replaces or reduces the need for artificial lighting. Featured is an industry first adjustable pitch adapter to maximize daylight collection during all daylight hours at all times of the year. The TGF flexible Sun Tunnel Skylight features a ring with a mirror finish just below the dome to reflect light from all angles. The flexible design of the tunnel makes the Model TGF the easiest tubular product to bend around attic obstructions and great for sunny areas. The TGF features an innovative one-piece low profile metal flashing that is parallel and blends into roofline. The TGF comes with a pre-assembled ceiling ring and paintable ceiling trim ring to complete any look. The standard Model TGF Sun Tunnel is designed for low profile roofing materials such as shingles and shakes. Tile flashing is also available for the 21" unit.